The 46th Street office in Manhattan was for years the magnet to a broad assortment of eccentrics, out of work performers, press agents and other dubious urban species. Among the most memorable of these was Izzy Grove, who operated a poster-placement business in New York, and occasionally booked small ads in the Weekly on its behalf. Izzy was a former professional boxer, and had the cauliflower ears and smashed-in snoot to prove it. He was a medium-sized man – he fought usually as a middleweight – with the attitude of a heavyweight. An office visit usually began on the street-level floor, which housed the advertising sales and production departments. It was here that on Wednesday mornings, publication day, show biz people would drop by, walk down a few steps, and find a few copies of the paper that were put out for anyone to look at who wished to do so. Bryer, whose desk was on that level of the building, recalls that many old vaudevillians, who had been on the stage since Sime’s day, and who still lived in mid-town Manhattan, would amble in to glance at that week’s pages. And since Wednesday was usually a slow day, often enough who chat with the sales and production staff. It was a practice that had begun sometime in the distant past and was not discouraged by publisher Syd Silverman. However, Izzy Grove tended to come in not just once a week, but two or three times a week. Sometimes he’d turn up to monitor the progress of one of his miniscule ads, and eventually came to be regarded as a nuisance by Jim Antinori, the production manager charged with laying out the blurbs. On one occasion, a consultation with Antinori turned into a disagreeable confrontation. Izzy, then a still formidable 60-something, came on hard, and was quickly dismissed. Assuming Antinori would back down if things got physical, Izzy turned threatening. A big mistake. The usually implacable Antinori was known to harbor a rarely-displayed hot temper (he was of Italian ancestry) and was himself a man of size. Jim got up from behind his desk and with dukes up, went after Izzy. The two were quickly separated by co-author Bryer and ad manager Murray Rann (himself no shrinking violet, especially in the vocal department). Publisher Syd Silverman, usually the soul of the unflappability, took one look at Izzy and ordered him from the building. Someone remembers Syd saying: “Izzy, you get the hell out of here, right now.” Izzy complied. Not all of Izzy’s 46th Street visits were unpleasant. He had an entertainingly brash side that sometimes manifested in Hyde-Park-style speechifying on the second floor, which housed the editorial staff. Reporters typing away on trusty Royal manuals were occasionally interrupted by a raspy-voiced, heavily New Yawk-accented Izzy standing on the elevated platform — where Syd and editor Abel Green sat — in full oratorical flight about some inconsequential subject. Izzy would often mention that he was once a pro boxer. But he was sketchy about the details of his career, generating skepticism from the always-skeptical Variety staff. It turns out Izzy never fought the Kid, at least not officially. Bryer recalls specifically that Izzy also said that he once fought a certain Ignacio Ara. That information was duly filed, and for years meant nothing particularly special to anyone. However, a recent computer check of Izzy’s actual fight career provides a fuller retrospective, and some touching insight. 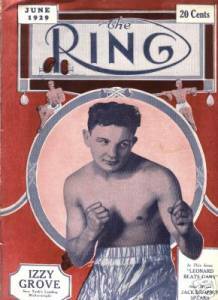 Izzy boxed professionally from Dec. 18, 1926 through April 12, 1932 – just six years in all but nonetheless a respectable ring career. He was definitely no tomato can. He had a total of 72 bouts, winning 35 (four by knockouts) and losing 30 (alas, 10 of these by knockout). The rest of the matches were draws. One wonders in retrospect what effect those 10 knockouts had on Izzy’s noggin. As mentioned, Izzy was a middleweight (the same division that such luminaries as Jake LaMotta and Sugar Ray Robinson fought in). Izzy’s opponent in two of his 1927 bouts had a reasonably bigtime show biz connection. The opponent was a strong black pugilist boxing under the name of Canada Lee (James Canegata). Izzy lost the first four rounder, but trounced Lee in the second, six-round punchup, with both fights decided by points, no knockouts. Although he had a similar career to Lee’s, Izzy was much the better boxer. He fought almost exclusively in the New York City area, encountering foes with such colorful names as Danny “Irish” Fagin, Gorilla Jones, someone who boxed under the single name of Roscoe, Vince Dundee, Hilario Martinez and Augie Pisano. Izzy’s bouts were held in such legendary venues as St. Nicholas Arena, Ebbets Field (home of the old Brooklyn Dodgers) and Coney Island Stadium. More impressive, Izzy also fought on boxing cards held in the Polo Grounds (longtime base of the N.Y. Giants baseball team) and at Yankee Stadium. He was no mere club fighter. One suspects that the absolute highlight of Izzy’s ring career occurred on Oct. 12, 1930, in Havana, Cuba. This occasion was the one and only time he fought outside the U.S. His opponent that night was one Ignacio Ara (1909-1977), a superb pugilist who was much better than Izzy. Ara was a world-rated contender, a European Middleweight Champion and double Spanish champion both as a middleweight and as a light heavyweight. He was a native of Sigues, Zaragoza, Spain, and he went on to have an illustrious ring career spanning more than two decades. Ara was considered “iron-chinned” and unstoppable, even though his career numbers list 135 wins (an impressive 60 by knockout) with 23 losses and 18 draws. Still in all, his career covers 105 bouts MORE than Izzy fought in his whole ring career. When they met in Havana, Ara was just 21, and had won his last three bouts. He went on to win his six ensuing bouts as well. In other words, Ara was on a hot streak. This was a big step up for Izzy in the level of competition. “The Ring Magazine” (issue of De. 1930, page 61) noted that “Grove was the first importation to Havana to extend Ara.” In other words, Izzy was specially booked to test the strong Spaniard. Few if any of the Variety staff who encountered Izzy in the 46th Street office knew of his distinguished boxing past nor that he had, on that faraway night in Havana, battled a real champion with style, guts and class. After Variety was sold and the 46th Street office was demolished, Izzy showed up one day at the new corporate offices on New York’s Park Avenue South. He took one look, and never returned. We salute Izzy, another precious memory from our 46th Street days. This entry was posted in Misc, Retro. Bookmark the permalink.